There are morning reads and there are other reads. Other reads can be read in the morning, but morning reads don’t want to be experienced except in the early hours of the day when your mind is freshest, most philosophical and most optimistic. Preferably also you have a cup of coffee in hand and a block of uninterrupted time set aside. “A Place of My Own” by Michael Pollan has been my morning read for the last couple months. I take in only a handful of pages at each sitting — this is all you need of a morning read. The book is the story of Pollan building himself a writing house in the woods of his large property in Connecticut. But also, says Pollan, it “looks at the art of architecture and the work of building through the lens of nature.” It’s no simple telling of the steps of drawing blueprints to framing to roofing. “A Place of My Own” ponders why we build shelters, why we use cedar for shingles, why architects and carpenters don’t love each other, why Pollan feels the need to get his own hands dirty instead of just hiring the work out. There are digressions about the challenges of designing inswinging windows, the limits of modernist architectural styles, and how trim around a window is like a transitional phrase in a narrative. The book is a building of words as much as words about a building. I tried to read “A Place of My Own” in the evening once and it went nowhere. My late-day mind kept skimming over sentences that included words like declension, belvedere, and fenestration. And when Pollan began to talk of “Modernism’s program of psychological hygiene” I was done for. These are things I might care to read about in the morning, only in the morning. I do my learning and my philosophizing best in the morning — I do my writing in the morning. The rest of the day I do my doing. I get up for work before the sun, and then I turn on the light and I cringe. It blinds me. I look the other way and I blink and I stand and wait until slowly I acclimate. Then I can see the shower to turn it on and get to the business of the morning. I remember waking before the sun for work in Lesotho. Actually, I would wake before the sun because I wanted to study Sesotho for an hour before going to do my teaching work. 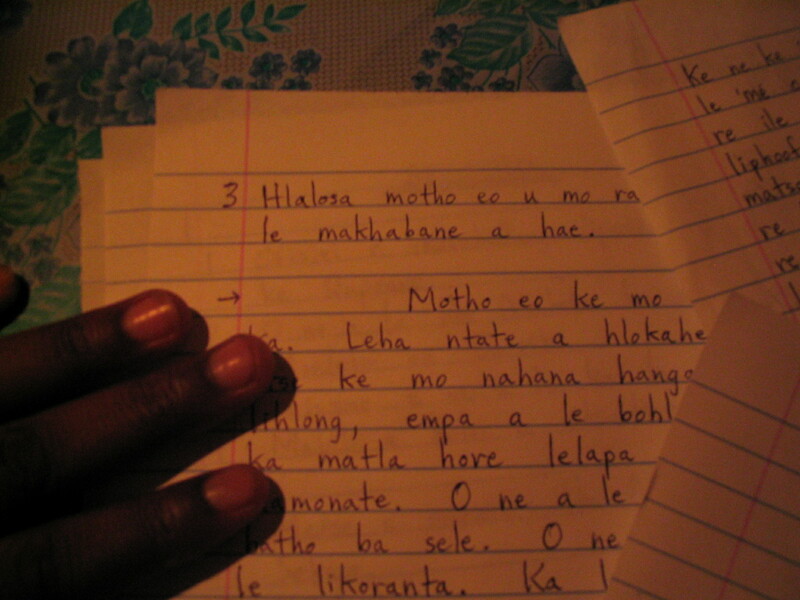 Some of my Sesotho homework, under candle light. I got out of bed and shuffled carefully in the black to the table upon which I kept my box of matches. I struck a match — the light was small and orange, not blinding white — and then I lit the wick of the nearby candle. The room was slightly, partially, innocently illuminated. I eased into the day. Electricity is cool, yes. I like being able to use this laptop computer. But sometimes I think of switching back to candles, just in the pre-dawn mornings, just for that smoother transition between sleep, darkness, and a busy day. I’ll be talking about The Mountain School at the UCSD bookstore on February 12 at 4pm. A link to the event’s site. While I was teaching at Ngoana Jesu Secondary School in my third year, one of my students, Maleshoane Thaki, gained admittance to the National University of Lesotho. She was the first from our school, ever. We were all so shocked, and proud. This month, September 2013, four more of my former students graduate from NUL. It’s the only university in the country. It’s a big deal for any Mosotho student to get in and graduate, but it’s beyond unprecedented for four former Ngoana Jesu students to be graduating with bachelor’s degrees from NUL in one year. Three of the four names you’ll recognize from The Mountain School: Congratulations to Lemeko Molefi (the rock climber), Sepheche Adoro (the initiate), and ‘Malefa Taunyane (the super student). And congrats also to Tahleho Morobane, who is ‘Malefa’s close friend. Lemeko’s degree is in Development Studies and Environmental History; Sepheche’s degree is in Sociology and Anthropology; ‘Malefa and Tahleho both earned degrees in Education. Four of my former students graduating from NUL this year, and ‘Malefa the best in the entire university in her field — I feel something like the pride of a father. I can’t wait to see what rivers they ford next. A former student from Lesotho posted this on Facebook the other day, and that’s my usual reaction to any posting from someone in Lesotho: What? And over the past year or two I’ve noticed that Facebook, Sesotho style, follows a number of common practices. First, there’s the mixture of Sesotho and English. This is not done because I might read the post. Mixing Sesotho and English is something that Basotho do even among themselves as soon as they learn their first English words. It’s done for a variety of reasons, one of which is to show off one’s education. The Sesotho-English mixture can be confusing for me, which wouldn’t be the case except that the words are always abbreviated, as if it’s a text message — and abbreviated in unorthodox ways. “Mornin” is obvious, but “cn’t”? Why not just add the a to make it a complete “can’t”? You add the apostrophe, but not the a? Although I don’t have much experience Facebooking people from other parts of the world, from what I can gather, posts from people in Lesotho do have things in common with posts from Americans and others. There are way too many self-portraits put up — big, nose-hair showing portraits. There for me to read are also messages with too much personal information about romantic relationships and other things that spark outpourings of emotion and ought to be kept private. Seemingly peculiar to Sesotho style, however, are two more things. Males post more about soccer than anything else. Constantly, soccer, soccer, soccer, especially when the two big South African teams, Orlando Pirates and Kaizer Chiefs, are playing. And finally, both males and females do something that anyone who taught in a school in Lesotho will recognize instantly, and that is they love to give advice, and to do so by speaking in proverbs, usually Biblical ones. Our school and village had no electricity. When I left in 2007, I kept in touch with people mostly through letters. The school and village still don’t have electricity, but these days I keep in touch with people mostly through Facebook. Many of my former students now have cell phones. Some of them live in towns where they have electricity and can charge them in an outlet connected to the grid while some still live in the village and charge the phones with small solar panels or by paying someone who can take it to electricityland. They Facebook on these phones, and some are on the site almost as much as an American teenager. The situation blows me away because I was the first to show the students a digital camera back then. I would ask them if they had heard of the Internet and not a single student even knew what it was. It’s been such a rapid transition — only six years — to go from the 19th century to the 21st. And they virtually skipped the intermediate technologies of landline telephones, then cell phones used for talking, then personal computers used for email. It was straight from writing on paper and licking a stamp to social networks on the Internet. Talk about bridging a gap. They are now on equal footing with everyone in the richest countries in this respect. I’ve heard of writers who don’t read reviews of their books. I understand the temptation to avoid being criticized, but I see “The Mountain School” as a conversation starter, just the first word in a dialogue, and so for me to ignore a review would be like refusing to participate in what I aimed to get rolling. Still, the last review I read began by complementing me as an “extremely gifted writer” and calling the pacing of the book perfect only to later say that some of the things I did in the book were “morally indefensible” and made the reviewer feel “creepy.” She also said she wished I had devoted more ink to the position of women in Lesotho, and then noted that I’m not someone she would want to sit down and drink a beer with. Ouch. It was a customer review on Amazon. It was just a customer review on Amazon, you might say. It’s not to be taken as seriously as a published review in a newspaper, for example. I disagree. In fact, I take this type of review — just as one from Goodreads or one passed along to me directly in conversation or email — equally as seriously as any written professionally. There are perceptive readers everywhere. So I hesitated when I came upon another review this morning, this one on a website called Peace Corps Writers: I’ll read it later. No, remember why you wrote the book. Read it now. I’m glad I did. It turned out to be good through and through. When I say good I don’t mean stroking my ego. I’m truly grateful for constructive criticism. Rather, a good book review, I think, is one that shows careful attention to the text and evaluates the book based on what type of book it is and not on what it could be. I don’t mind being called creepy, as long as it’s because of something I actually did in the book, but “The Mountain School” shouldn’t be judged on its lack of attention to women’s rights in Lesotho. This book was meant to capture my time in Ts’oeneng, nothing more, nothing less. It isn’t a treatise on gender rights. Did it do a good job of taking you with me to Ts’oeneng and giving you that story? What I also appreciated about this review was that Swesnik made personal connections to my experience in Ts’oeneng. She had been a Peace Corps volunteer in Mali in the 1990s, where she found herself in situations similar to mine in Lesotho. I learned from the connections she made between my and her stories. And she pointed out that my being an outsider in Ts’oeneng — that our being outsiders in Africa — is not unique. It is like something everyone experiences many times in life. It is frequent and universal to feel like you don’t fit in. I like that Swesnik pointed that out because I felt like she understood the book as I had tried to craft it. The first line in the dialogue had been successfully delivered, and the response had too. Below are a dozen prods. Use them to further consider what is in The Mountain School. Share with a friend, a book club, a group of students. 1. If judged through most news stories, we get the impression that Africa is two things: a romantic land of wild animals, and a desperate place of war and poverty. What is the Africa you experience through The Mountain School? 2. Alder predicts early on that his proficiency in the local language, Sesotho, will determine his enjoyment of life in Tšoeneng. So he dedicates himself to learning it, despite having only a single, old grammar book. Was it nevertheless worth his time and effort? Is learning the local language the duty of migrants? 3. Learning to live a simple, rural Basotho life proves very satisfying to Alder, and yet many Basotho want a more urban, Western life. Is this just a “grass is always greener” scenario? Or is it something else? 4. Alder thinks of Tšoeneng and America as being so different that they feel like separate, parallel worlds. Why? Does this make you suspect that globalization is not as far-reaching as some would have us believe? 5. Recall the kidnapping of Motšilisi. Do you agree with Alder’s approach of not wanting to impose on the runnings of the local culture? When should one intervene while living in a new place? 6. Throughout The Mountain School we see changes in the village, school, and people: the road is paved the year Alder arrives; the school puts up a fence and a new hostel building the year after that; most teachers have cell phones by 2006. What developments do you think might have occurred since then? 7. The development projects of Americans and other foreigners in Lesotho are sometimes misguided. How? Can outsiders help Basotho? 8. Tholang and Makhala do household chores for “Sir Greg,” as Basotho youth are taught to always serve their elders. Is it different in your family or community? Is that good or bad? 9. In the end, Alder has a feeling of belonging and not belonging at the same time. Why doesn’t he totally belong? Do you think an outsider could ever fully fit into this place? 10. Also in the final section of the book, Alder says that he at last feels a certain maturity, like he has passed through a second youth in Lesotho. How do you think this might affect him upon his return to America? Will any of his new skills translate to life there? 11. What does the title of the book, The Mountain School, refer to? 12. What do you think Alder’s goals were in writing this book? Is there a main message he’d like the reader to take from it? CLICK HERE for a downloadable version of these questions. It has been a long and winding road for The Mountain School to get back home, but it has finally landed back in Lesotho at the Museum Store in Morija. This is the store attached to the country’s only real museum, and Morija is the town where the country’s first foreigners (the Frenchman Eugene Casalis and company) arrived to stay back in the 1830’s. The Morija Museum’s curator, Stephen Gill, is a great resource who has received the stock of books I sent and placed them for sale at M190 each, which is almost $20. But this was as low as we could make the price; it’s inordinately expensive to ship to Africa! Nevertheless, it feels great to know that my friends in Lesotho can now have a real-life look at the book. Up until now that wasn’t possible because people in Lesotho are very limited in their ability to purchase things online. Very few have credit cards, and many don’t have addresses or post office boxes at which to receive items. For them, there is simply no option of ordering something from Amazon and having it delivered. Beyond that, even for those who have a computer there is trouble downloading. I don’t know the technical background involved, but I’ve worked with Lemeko, my most computer-literate former student, for months trying to get an e-book onto his laptop without success. So really the only choice is boxing up physical books in the U.S.A. and personally shipping them to a physical bookstore — and hoping customs fees are not unreasonable. That’s how it was done. Again, thanks to Stephen Gill and the Morija Museum for being so helpful with the logistics, and also for the enthusiastic reception and review of the book. 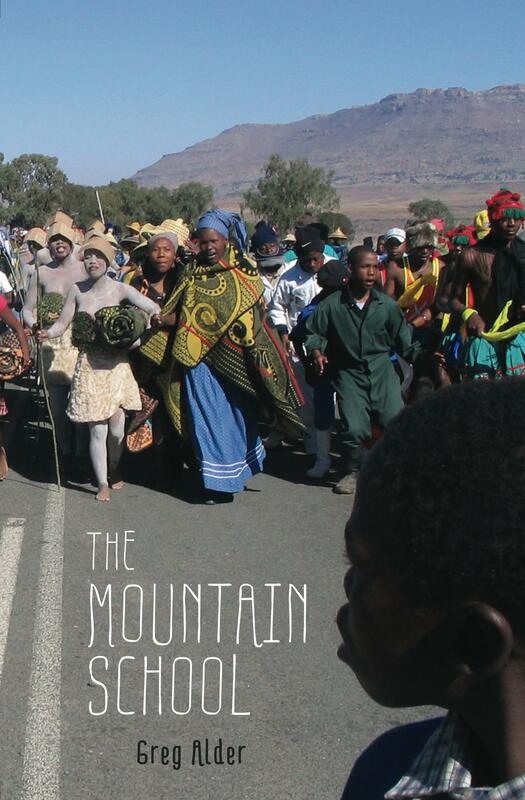 I love the idea of The Mountain School being there in the cultural heart of Lesotho. Read more about Morija and the Museum here.